Helpfully parked right by the door, so that even we couldn't miss it was the sexiest bike at the show, the Ridgeback Flight Ti. We're big fans of Ridgeback's flat bar'd road range, Madison have a strong case to be the inventors of the genre, the Flight Ti is basically the current Ridgeback range topper, the Flight 05, in titanium rather than triple butted aluminium. The rest of the setup is a carbon fork, and a decent wheelset, XT Deore disc brakes and some nice Continental Ultra Gatorskin tyres. 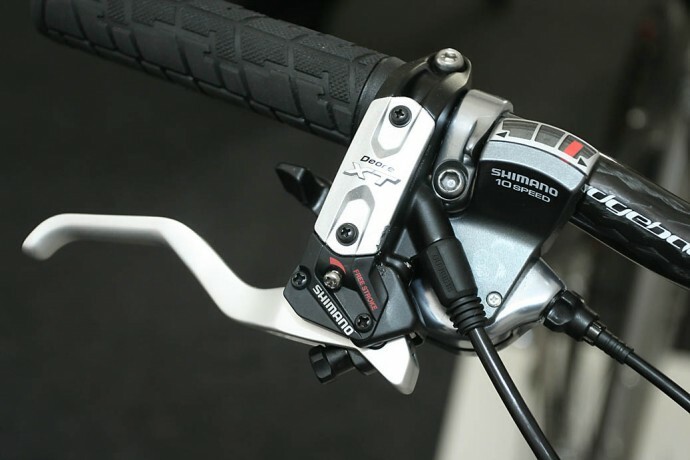 Groupset on the prototype was Shimano 105, if it ever goes into production that will be Ultegra (like the Flight 05) and there is the possibility of a titanium rather than carbon fork too. 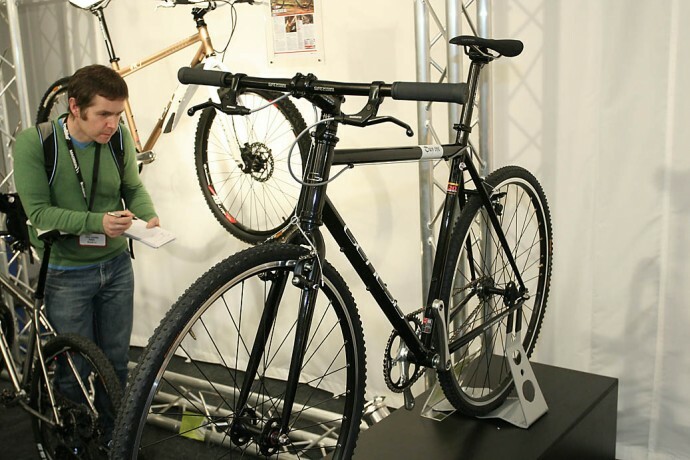 The bike was conceived as a riposte to the high end carbon flat bar'd bikes produced by the likes of Trek and Specialized, Ridgeback's Toby Howes reasoning that Titanium still has more cachet than carbon with a lot of bike buyers. In many ways this is my ultimate bike combining two of my favourite bike types: flat bar'd road bikes and titanium… anything. Not sure how I'd feel locking it up outside Sainsbury's, but it would be great on big rides. 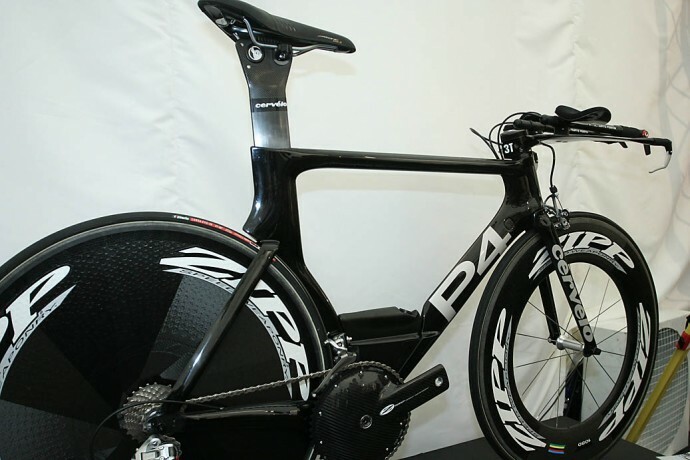 So how likely are we to be seeing it in a bike shop any time soon? Not very because even if it does make it into production, Toby Hawes, the man behind the Ridgeback range reckons that it will be as a limited edition of 25 – the minimum batch size the factory would build. The big stumbling block is one of economics: with the pound falling so much against the dollar all bike companies and distributors are being forced to put up their prices, originally Madison were trying to produce something costing around £1800 – that has now been blown out of the window… so if it does make the shops expect to be looking at a price tag nearer the £2500 mark. Urban MTBs have been rather eclipsed in the last few years, but they still have their fans and bikes like the still very competitively priced Cyclone at £299.99 and its bigger brother the Nemesis (with Shimano Alfine hub gears, Shimano hydraulic discs, ooh and a nice pair of Conti Contact Sports) at £699 will deliver in terms of durability and acceleration. Where they come up short against a 700c bike is in top end speed, on the other hand they are more agile at nipping in and out of traffic, and they are certainly more chuckable and in purely practical terms they score over a fixed every time… for me anyway. Genesis, Madison's other in-house bike brand, had some very tasty looking 'crossers in both double butted Reynolds 520 Chromoly and triple-butted aluminium. The other eye-catching bike from a roadie point of view is the Flyer, their fixed/singlespeed machine. You couldn't really miss this lime green framed and white carbon forked beauty when you walked past the Genesis stand – it's certainly no shrinking violet. James Olsen, who designs the Genesis bikes, has gone for a more relaxed geometry somewhere between a standard track bike and a road bike. 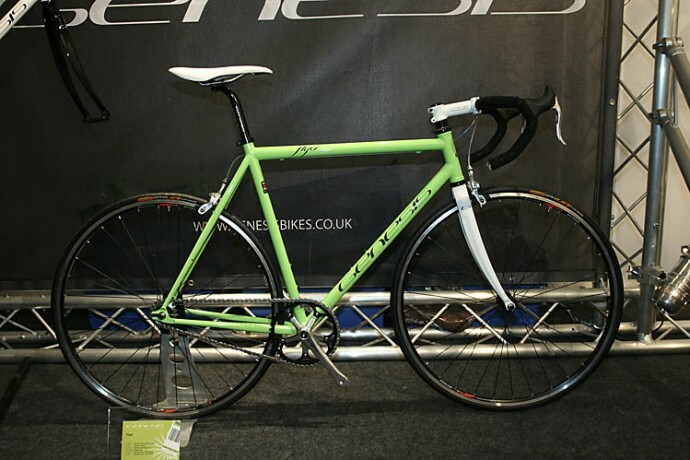 His take is that he wanted to create a bike that would 'handle' more like a road bike, but still retain some of the immediacy associated with track frames. As he told us, you might not want to lay it down going into a fast corner on a wet descent the way you would on a road bike (not sure I would want to do that on a road bike) but it is going to be a lot more forgiving in most of the situations it's likely to be ridden than something with a much steeper track oriented geometry. That frame is Reynolds 520 double butted steel with a drivetrain combo of Sugino 48T crankset matched up to a Shimano Sora18T cog. Brakes are Shimano Sora, matched up to Shimano R600 levers and the wheelset is built up using Formula track hubs laced to Alex rims wrapped in some Continental Ultra Race rubber. A feature of all Madison's bikes this year is that they have better tyres than you would expect at this price point – way better in some cases. 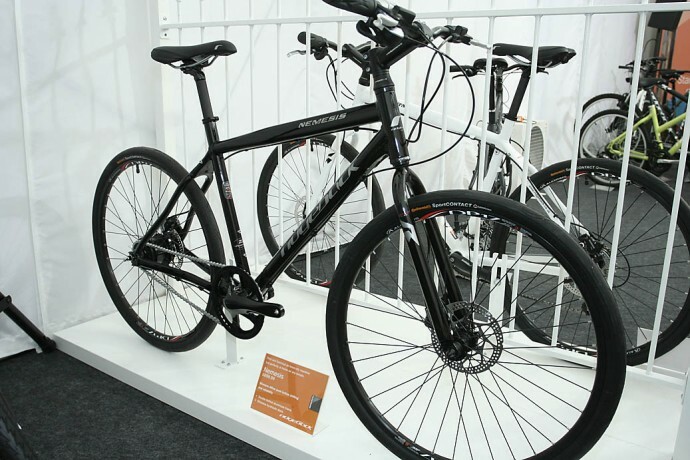 From a user's point of view this is doubly sound – you're getting better value for money (at a time when bike prices are going up dramatically), and, more importantly, you are getting a better ride. Tyres may not be the most expensive or sexiest component on a bike, but they do have a massive role to play in what it rides like. It goes without saying that better tyres generally give a better riding experience. On the 'cross side of things Genesis has some interesting machines too. Pick of the crop is the range-topping Genesis Day One, a flat bar'd single speed 'crosser, again in double butted Reynolds 520 with a Sugino 46T chainset driving a 18T Shimano sprocket. We wondered if that was a tad high for 'cross, but then we're wimps although we did notice that James's own Day One sported a 39T chainset and drops – a possible indicator of things to come in 2010. What we'd like to see is a road-going version swapping those cantis for calliper brakes and the Continental Speed Kings for a set of Ultra Gatorskins – couldn't make our minds up whether it'd be more fun with or without the drops James had on his bike. We put it to him and he didn't totally rule it out. 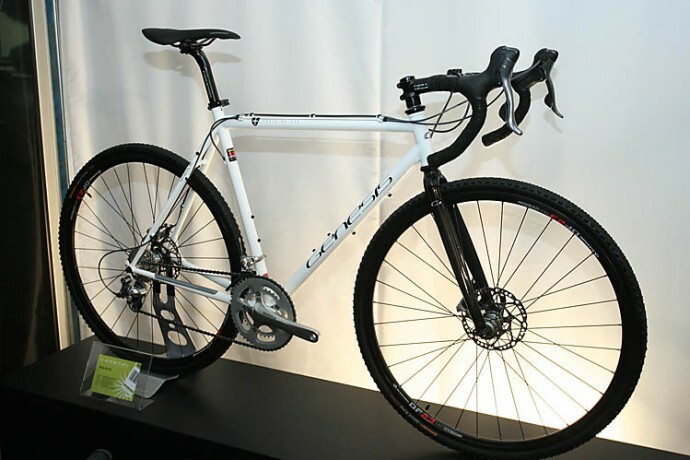 Not so long ago 'cross bikes (or bikes with a big slab of 'crosser in their DNA) were being touted as ideal commuting bikes – they still are in my book, simply because they are adaptable, tough and handle well – they certainly beat a track-style bike on all those counts hands down. For the moment though they are just not fashionable enough but their time may still come. We also liked the look of the Croix De Fer – this is a Genesis 'cross bike with gears, 20 of 'em to be precise courtesy of Shimano 105. 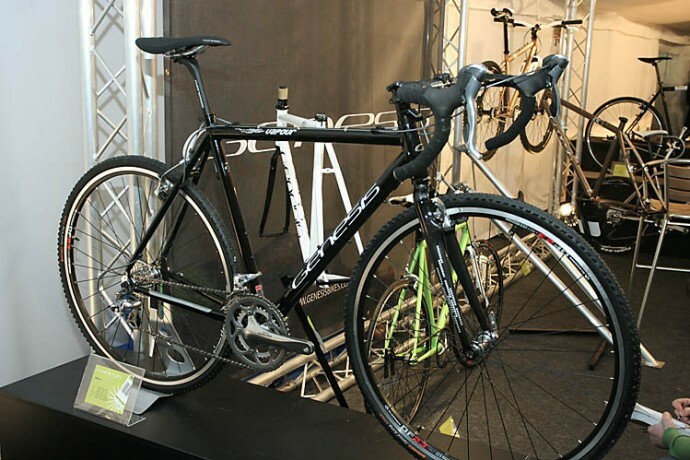 Again it's in steel, which again is Reynolds 520 double butted matched up to a carbon fork with aluminium steerer. Drivetrain is the aforementioned Shimano 105 paired with an R600 50-34T compact chainset and the wheels are Deore hubs laced to Alex rims with Continental Speed King tyres. There is also a cheaper version, The Vapour, in triple butted 6096 aluminium with a Tiagra/105 drivetrain, Shimano R550 canti brakes, and a wheelset consisting of Conti Speed Kings on Alex rims laced to Shimano Tiagra hubs.